Hieeeeee! I'm Flee! Or Flou Flou, as mom often calls me. I was born on March 11, 2007 at Blue Cedar kennels near Las Vegas, Nevada. 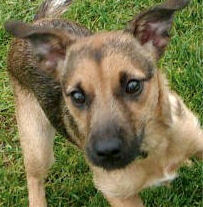 Now I live in Victoria, BC with my mom Martine, my litter-sister Sparrow, and my annoying older brother Papi. 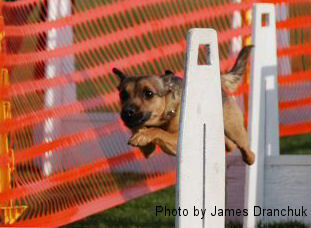 I was born in to flyball. Not only was I bred for sport, but my brother already had my mom addicted to the game. Ok, that's one thing I will give him credit for! Anyways, I've been a natural since day one, and Mom says that has been my biggest training challenge - that I'm always wanting to go, and go too fast, and if I'm not go-go-going, then I'm telling someone that I want to go, or telling the other dogs to hurry up 'cause it's my turn to go! Well, I'm finally playing for real, and I love it! I earned my first tournament points on June 28th, 2008, and achieved my first three titles that very weekend! Flyball is my most favourite thing, but in those times when the humans don't want to play, you'll find me playing fetch - with something - anything! It's the next best thing to flyball. I also like going to the lake with my brother and running like a fool with him. Mom has had lots of fun teaching me tricks too. My best ones are jump on Mom's back, peek-a-boo and giving French kisses! Did I mention my toys? I love my toys, all of them, any that I can fetch, but especially my tuggy. Oh, and any toy that squeaks! Ok, yea, so I'll focus on them til Mom has to put my toys away in the cupboard. When the day is done, my preferred place to chill is under the covers in my humans' bed, on top of my brother.